Burden’s Vacuum stocks and displays all the Miele canister vacuum cleaners. We guarantee our pricing on all Miele products. Plus, when you buy from Burden’s, you get our FREE and famous service and repair benefits that you don’t get when you purchase Miele elsewhere. Burden’s Vacuum is also your local Factory Authorized Miele service and repair facility. Let’s talk Miele. Let’s talk vacuums. It’s what we’ve been doing since 1961. The Miele Complete C3 Brilliant delivers thoughtful design and agile performance rarely seen in canister vacuums. Part of Miele’s C3 line, this model cleans medium to thick carpet but also works on smooth, delicate floors. A 12-stage sealed HEPA filtration system is independently lab-tested to capture 99.97% of allergens as small as .3 microns. The Brilliant offers various features not included with other Miele vacuums. A deluxe handle grip with button controls and automatic settings mean hassle-free movement from hardwoods to thick carpeting requires no extra work from you. The Brilliant comes with 3 floor heads: the Electro Premium Powerbrush keeps carpet plush and clean, while the Parquet Twister XL Floor Tool cleans bare floors. The AllTeQ Combination Floor Brush is ideal for going from smooth flooring to low-pile carpeting. The Electro Premium brush is powered by its own motor head for strong suction. An LED headlight on this tool illuminates the floor so cleaning under tables or in poorly-lit spaces isn’t a problem. Attach the Parquet Twister floor tool to clean smooth flooring with its soft but powerful fibers. Its neck twists a full 180 degrees to swivel around furniture legs or other obstacles. The wide cleaning path of the Parquet Twister allows you to easily swipe dust from moldings and baseboards with a gentle lift, and then lay it flat against the floor to get deep under furniture. These tools are made even more nimble by the electric, stainless steel, telescopic wand that extends to reach difficult places with an easy click of a button near the handle. The Miele Brilliant has a 12-stage AirClean Sealed System that virtually eliminates the chance of allergens escaping from the vacuum’s chambers. The sealant around the casing forces air to move through the patented filtration system, meaning vacuumed air can’t leak out. An included Active HEPA Filter contains a charcoal film to neutralize odors, and is tested to pass strict European EN1822 filtration standards to capture 99.99% of all particles as small as 0.3 microns. A filter replacement indicator light lets you know when you need to replace it. The Brilliant’s GN 3D Efficiency bags are specially constructed to keep dust particles contained and consist of 9 electrostatically-charged layers and a self-locking collar. Deluxe Handle With Controls—Easily access the Electrobrush and suction controls, which are located on the ergonomic handle grip. There are six available suction settings for different surfaces, including an automatic mode that automatically adjusts as you clean. Parking System—This vacuum stays lit for 30 seconds after you turn it off, allowing for effortless stowing in a closet or pantry. After being tested for integrity and performance by the scientists, engineers, and technicians at the Good Housekeeping Institute, this Miele canister vacuum has earned the Good Housekeeping Seal. 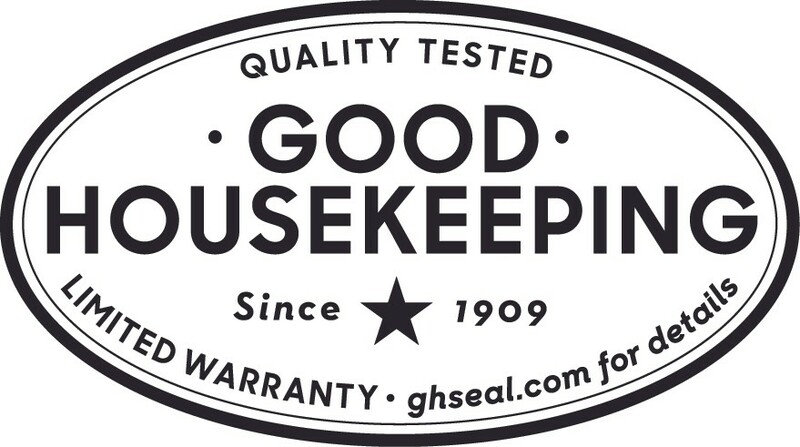 When you see the seal you’ll know the product has a Good Housekeeping 2-year limited warranty covering repairs and replacements of defective parts. Lightweight Skeleton Construction—This 11-pound vacuum coasts lightly along floors for faster, more enjoyable cleaning. Virtually Silent Operation—The 1,200-watt motor is powerful yet quiet thanks to its insulation. Integrated Tools—The dusting brush, upholstery tool, and crevice nozzle are stored on a single carrier that fits neatly into the velvet accessory compartment. 36-Foot Cleaning Radius—The 21-foot cord, combined with the hose and telescopic wand, provides a 36-foot cleaning radius. Automatic Standby—Take a quick break without having to turn the vacuum off. Instead, slide the wand into a parking receiver on the base, which activates a sensor to put the Brilliant in standby mode. Automatic Height Adjustment—Use the automatic height adjustment setting if you don’t want to alter the power level yourself as you clean different flooring types. Durable Casing— The rich metallic casing is not just attractive, but resilient, consisting of the same high-impact ABS plastics used to make professional football helmets. Hassle-Free Repairs— Should you need a repair, there’s no hassle or shipping involved. Simply go to one of the authorized Miele dealers in your area. One-touch Cable Rewind—Rewind the cable with one simple touch of the button. Keep every surface from smooth bare floors to heavy-pile carpet clean for years with the Miele Brilliant canister vacuum. Classic and Lean—Clean your home with ease by using the intuitive tools and controls included in this lightweight, purposefully-designed vacuum. Lasting Quality—Each vacuum goes through product durability assessments to meet a 20 year life expectancy. Your Brilliant comes with a 10-year warranty on the motor and casing, plus a 5-year warranty on parts and labor. 12-Stage AirClean Sealed Filtration—99.97% of particles as small as .3 microns are captured and retained as vacuumed air passes through 12 stages of filtration, including an active HEPA filter. Special Filter for Homes With Pets—If you have pets, you may want to use Miele’s Active Air Clean Filter, which offers even more advanced odor control.